Walter Vergnano quit the Teatro Regio di Torino last night after 19 years as sovrintendente. His departure triggered the instant resignations of Gianandrea Noseda, the music director and Gastón Fournier-Facio, the artistic director, leaving the theatre headless. The reasons are political. 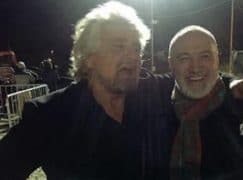 The mayor of Turin aims to replace Vergnano with the veteran director Giancarlo Del Monaco, who is a close friend of the Five-Star party leader Beppe Grillo (pictured). Giancarlo Del Monaco is married or coupled with a soprano Lana Kos. So there is a house soprano, of course! If it’s headless perhaps the next opera will be “Marie Antoinette”? Of course, everything in Italy is political, especially, and certainly not exclusively, when it comes to opera. The country and its culture and economy are in tatters, and, like soccer and opera, amici-degli-amici-corruption is as ubiquitous as ever, whilst food, wine, and everything else that is edible or potable is sublime. Grande bellezza e morbilità. I welcome mr del monaco, his Bonn tenure was wonderful, inspiring choices of operas and good casting ! !